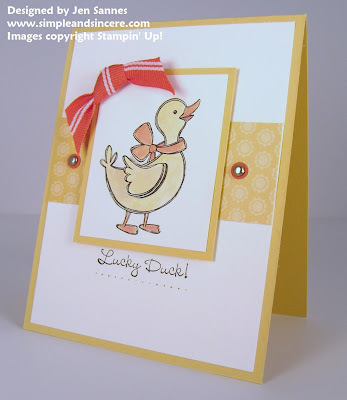 I love this cute little duck from the Wagon Full of Fun set! And this color combination (So Saffron and Tangerine Tango) just makes you happy, right? This is a simple card, but there's a lot to say about the little details. Here you can see how I popped up the wing, to add a little dimension to the image. Don't forget to leave a comment today for my blog candy give-away in honor of my blogoversary! I will draw one winner using Random.org tomorrow morning at 7am. The winner will receive a Congrats stamp set (from SAB 2009) and a pack of the Delicate Dots designer series paper. Good luck! Cute card! I like how you popped that wing. Also, you can't go wrong with yellow. It is a very simple and sweet card. You have beautiful designs. congrats on your blogoversary! Very cute card. Congrats on your blogoversary!! I LOVE your stampin' style!! This blog stuff always perplexes me. I think your ducky card is quite springy. The wing detail is so aptly shown due to your expert photography. You have so many wonderful ideas! Thanks again for the mother/daughter show last Sunday! This card is adorable and you do lovely, lovely work. First visit to your blog. I'll be back! Love the colors together! Great card. Just discovered your blog...will be spending more time here! I love your card. I am a huge fan of the duck also and the wagon in that set. I still need to get that set. Thanks for the chance to win and happy blogoversary! Super cute card Jen! Keep up the great cards and cute ideas! I get inspiration from your cards. Now if I just had some time to use the inspiration! Hi Jen! As always, love your ideas. Keep up the blogging - you have the best ideas on the web! From a loyal blog-follower, but newbie poster. Your cards are the best :) Never can beat your ideas! From a long-time blog follower, newbie poster! Jen, Your card is just ducky! As others have stated, the popped wing adds a lot. Also like the circles under the brads. Love the card-simple, but cute. I love this stamp set. Very cute card! I just found your blog via SCS, I can't wait to check out your creations! Congrats on your blogaversary, too! Your card is very cute. I love how simple and sweet it is. Thanks for sharing. I was in such a hurry to beat the deadline, that I didn't make the comment I wanted to make. I love your style - it's crisp and clean and elegant. I also love the fact that you are a fellow Wisconsinite. We are a talented sort.